Fearlessly challenging the tight corners, the wildly spirited "Yarimawashi"
There are no other comparisons thinkable when it comes to the unparalleled relationship between Danjiri Matsuri and the people of Kishiwada. They have a unique calendar that begins with September—the starting month of the festival—and children born in Kishiwada learn how to pull the Danjiri (float) ropes before any other sports such as baseball or soccer. 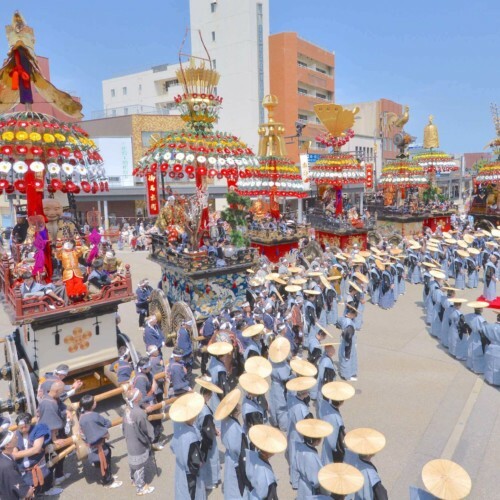 The trademark of Kishiwada's Danjiri Matsuri is the aggressive parade of the Danjiri floats, pulled through the towns like a roaring spirit. The brave sight of 400 to 1,000 men pulling on the two ropes attached to the Danjiri weighing more than 4 tons is utterly impressive. 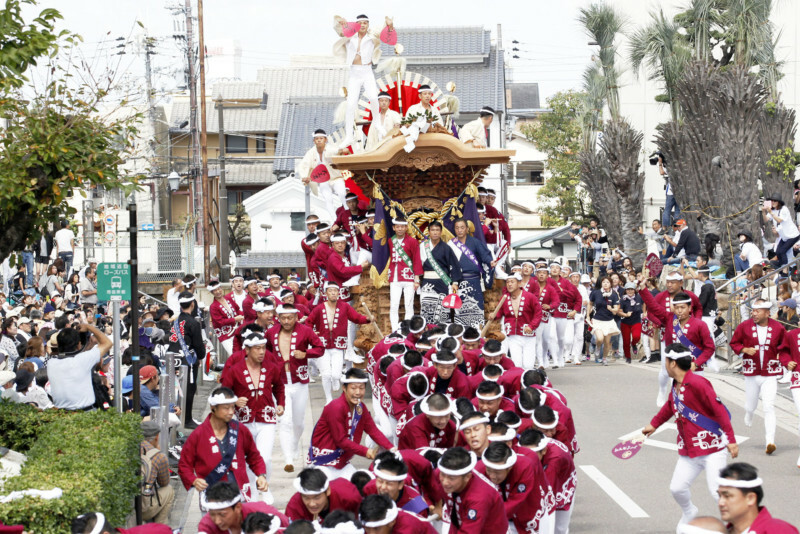 The highlight of the festival, especially, is the "Yarimawashi" when the Danjiri shreds through a tight corner going full speed. After sundown, a different scene comes into view. 200 or so paper lanterns are lit on each Danjiri, and are pulled at walking speed by a mix of adults and children. 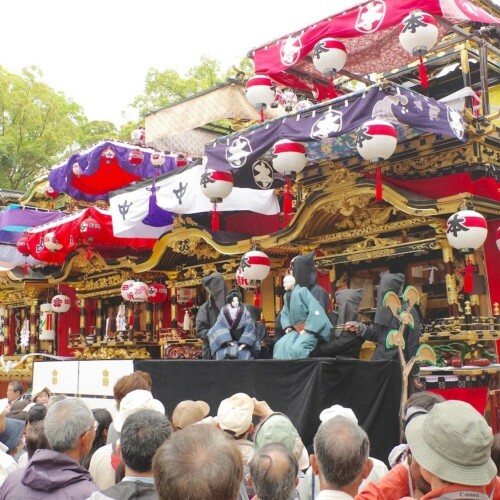 The festival is said to have started in the year 1703 when Lord Okabe Nagayasu—the ruler of Kishiwada-han (Domain) at the time—initiated a Inari Matsuri praying for good harvest. The festival and its skill & craft has since been passed down by the people of the land for over 300 years. 1. The wild "Yarimawashi" fearlessly challenging the tight turns! 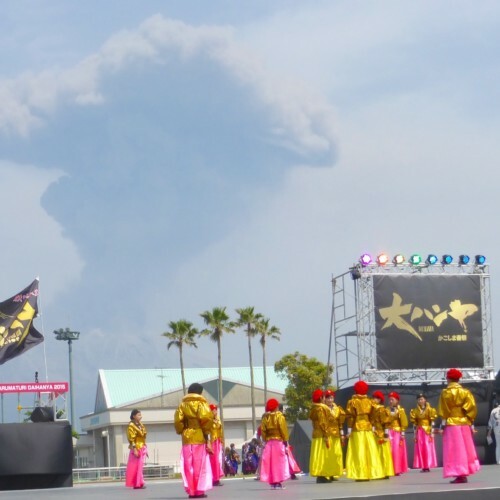 The highlight of the Kishiwada Danjiri Matsuri is the "Yarimawashi". 400 to 1,000 "Hikite" men pull the Danjiri (weighing more than 4 tons) around 90 degree turns while going full speed. 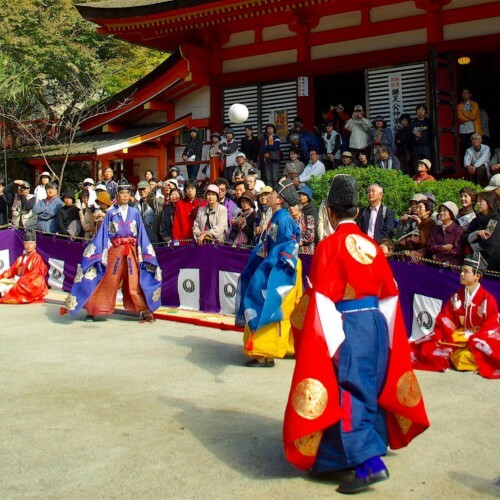 If you see it up-close, you will be overwhelmed by the striking intensity of the Danjiri whizzing by as the men yell out the chants "sorya, sorya!" "Yarimawashi"—the act of turning the Danjiri around 90 degree corners without halting its speed—obviously is an uneasy task requiring seasoned skill and a heightened sense of timing, combined with an ability to act as a unified team. With that said, the true highlight of the festival may be the spirit of unity, as those causing momentum and those in charge of turning, combine their efforts into one. While the eyes naturally are attracted to the rough nature of the festival, you cannot miss the beauty of elaborate carvings on the Danjiri floats. You will witness a great variety of pieces such as human figures, horses, sacred beasts, flowers, birds and even arabesque designs, all finished without the use of lacquer or gold overlay in order to accent the wood grain of Japanese elm. In contrast to the many festival floats across Japan that are lavishly ornamented, Kishiwada's Danjiri has kept its tradition of simple yet valiant build of "Izumibori" wood-carvings, passed down by local Miyadaiku (carpenters specializing in the construction of shrines and temples) masters who are said to have been involved in the construction of even the famous Nikko Tosho-gu in Tochigi. 3. 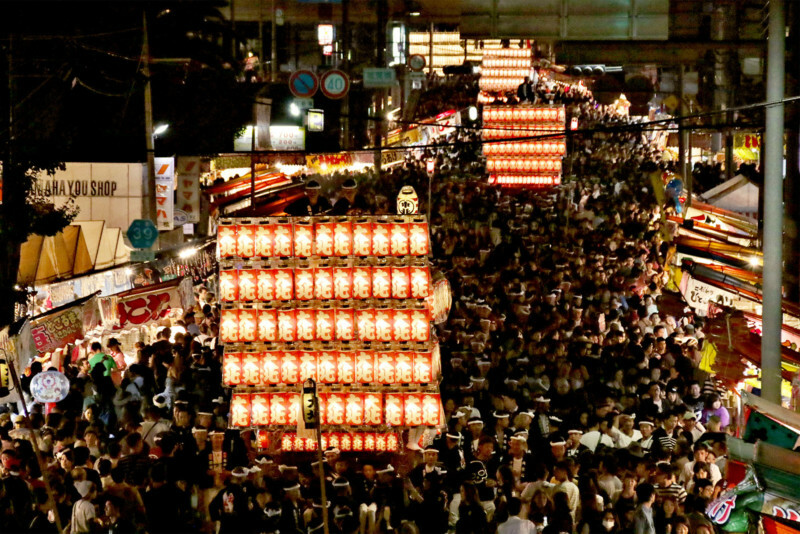 The graceful "Yakan-eiko" (night parade) displays the festival's "quiet" element. 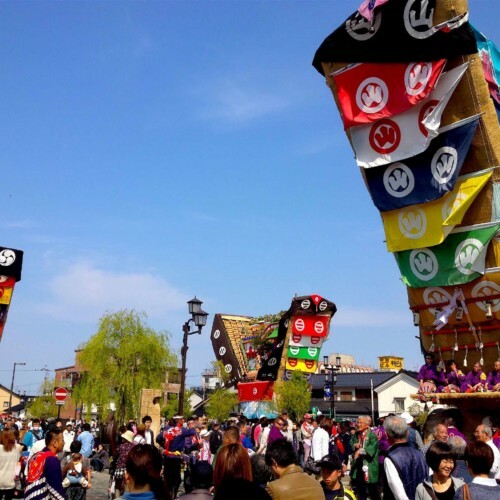 In contrast to the action-filled daytime parade, the "Yakan-eiko" features a mix of adults and children slowly pulling the Danjiri, lit-up with paper lanterns—displaying the "quiet" element of the festival. The floats give off a lush mystic atmosphere, quite different from the vigor of the daytime, each decorated using 200 lanterns. The delicately carved artwork on each Danjiri is the pride and honor of each town or district. The slow-moving "Yakan-eiko" is recommended for those who wish to view them up-close. International Reception and Info. Information for foreigners are available at Nankai Kishiwada Station during festival dates. Restrooms Temporary public toilets are available at various locations. Please follow the instructions by volunteer security guards wearing Happi. Dangerous areas are designated as off-limits. Please do not enter. Please do not get close to a moving Danjiri float. Please do not touch a parked Danjiri float. Please do not enter each of the districts'/festival organizers' rest stations. 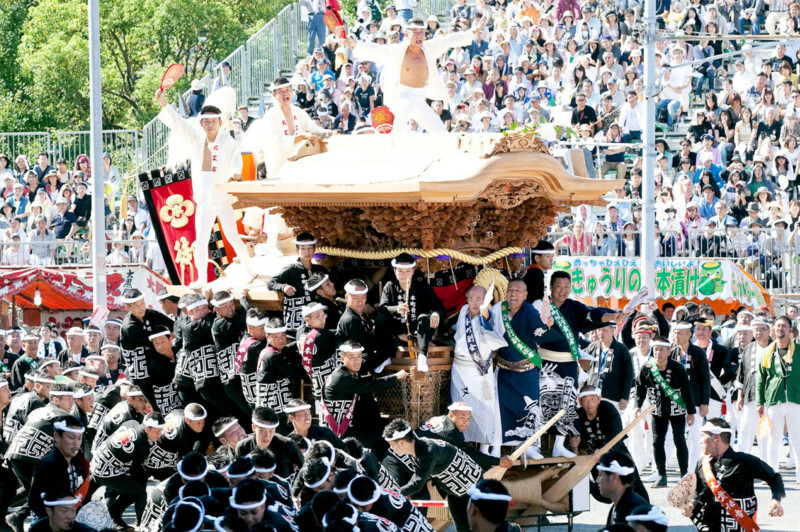 The Danjiri floats come rushing at full-speed. Please do not get run over. Please be mindful of others especially on narrow streets.